With The Hunger Games: Mockingjay Part 2 hitting theaters this weekend, stars Jennifer Lawrence, Josh Hutcherson and Liam Hemsworth have been making the press rounds as of late, but there is one interview that this trio won't soon forget. YouTube stars Anthony Padilla and Ian Hecox from Smosh have a running gag where Ian Hecox interviews celebrities, although he's fed instructions by Anthony Padilla through an earpiece. These pranksters had set up an interview with Jennifer Lawrence for this franchise finale, but little did they know, the tables were about to be turned on them. 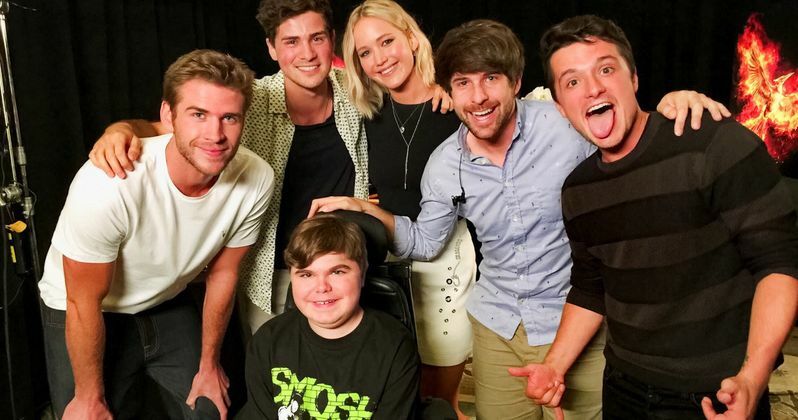 Smosh fan Dylan Miceli-Nelson, who suffers from Duchenne Muscular Dystrophy, teamed up with Prank It Forward and Jennifer Lawrence, Josh Hutcherson and Liam Hemsworth to prank these pranksters. Through the course of this awkward interview, Ian Hecox is told to remove his shoes and tells Jennifer Lawrence to shoot a small apple off his head with a Nerf crossbow. As the interview drags on, the actress becomes more and more uncomfortable before just leaving the interview altogether. Dylan Miceli-Nelson, Josh Hutcherson and Liam Hemsworth were watching the entire interview themselves, giving their own set of instructions to Jennifer Lawrence, before she walked out of the interview. Shortly after Josh Hutcherson and Liam Hemsworth came in to confront Ian Hecox about his awkward interview, it was revealed that the Smosh guys had been pranked. Jennifer Lawrence then came out with the mastermind Dylan Miceli-Nelson. This hilarious prank is also helping to benefit a good cause. For every fan who posts this video with the hashtag #PrankItFWD, and for every 1,000 YouTube views, $1 will be donated to DoSomething.org. You can also visit CDMD.UCLA.edu/BeReasonable to learn more about Duchenne Muscular Dystrophy, and visit Dylan's own https://www.youtube.com/channel/UCTVgol-0fs7TcCzHAF3Dfjg|YouTube channel as well. The eight-minute video has already gotten 1.7 million views in just over a day since it was posted, and you can take a look at the entire prank below. You can also check out a video where Dylan explains why he wanted to prank Smosh, and another video that goes behind-the-scenes of this epic interview. What do you think about The Hunger Games: Mockingjay Part 2 stars teaming up with a young fan to prank Smosh?